inControl is a web-based application with a configurable system to create Custom Workflows to capture data the fastest and best possible way based on your company’s needs. Using a mobile friendly design your scanners, tablets, and/or smartphones can capture data right at the source! 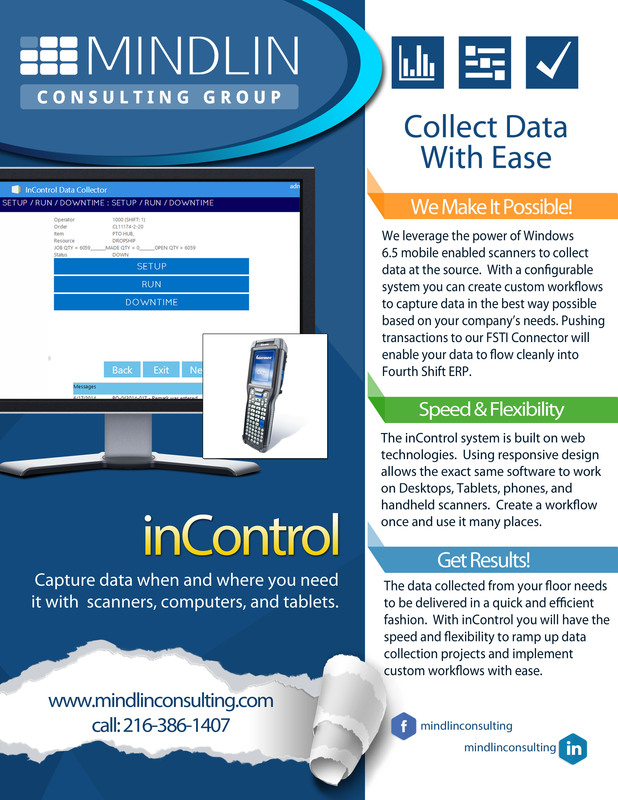 We leverage the power of Windows 6.5 mobile enabled scanners to collect data at the source. With a configurable system you can create custom workflows to capture data in the best way possible based on your company’s needs. Pushing transactions to our inFSTI connector will enable your data to flow cleanly into Fourth Shift ERP. Using a responsive design allows the exact same software to work on desktops, tablets, phones, and handheld scanners. Create a workflow once and use it in many places. The data collected from your floor needs to be delivered in a quick and efficient fashion. With inControl you will have the speed and flexibility to ramp up data collection and implement custom workflows with ease.